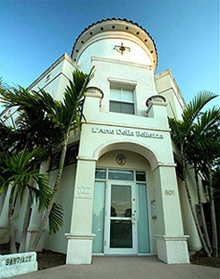 L'Arte Della Bellezza is located in a charming Spanish-style building that matches the traditional European architectural style, which accents the City of Coral Gables. There is ample private, covered parking. Visitors are awed by the finesse and harmony that the spa's ambience provides. Clients are greeted by its personable and professional staff. See our gallery for more images.